"Flathead Indian" redirects here. For the fish species, see Bartail flathead. 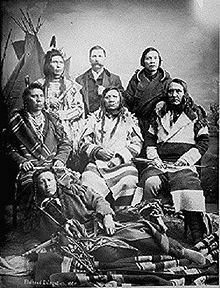 The Confederated Salish and Kootenai Tribes of the Flathead Reservation are a federally recognized tribe in the U.S. state of Montana. The government includes members of several Bitterroot Salish, Kutenai and Pend d'Oreilles tribes and is centered on the Flathead Indian Reservation. The peoples of this area were named Flathead Indians by Europeans who came to the area. The name was originally applied to various Salish peoples, based on the practice of artificial cranial deformation by some of the groups, though the modern groups associated with the Flathead Reservation never engaged in it. The Salis (Flatheads) initially lived entirely east of the Continental Divide but established their headquarters near the eastern slope of the Rocky Mountains. Occasionally, hunting parties went west of the Continental Divide but not west of the Bitterroot Range. The easternmost edge of their ancestral hunting forays were the Gallatin Range, Crazy Mountain, and Little Belt Ranges. Later well-established plains tribes like the Sarsi, Assiniboine, Cree, Crow, Gros Ventre, Arapaho, Cheyenne and Sioux lived far away. They were unknown to the Salish. :304 and 321. The Salish got horses from the Shoshone,:350 and the animal changed the life of the people. During dog days, the Salis paid no special attention to the buffalo. :345 It was hunted just like deer and elk. Newly acquired mounts made it possible to overtake the buffalo and the secured meat and skins could easily be carried by packhorses. All other game lost in importance. The Flatheads lived now between the Cascade Range and Rocky Mountains. The first written record of the tribes is either from their meeting with trapper Andrew Garcia, explorer David Thompson, or the Lewis and Clark Expedition (September 4, 1805). Lewis and Clark came there and asked for horses but eventually ate the horses due to starvation. The Flatheads also appear in the records of the Roman Catholic Church at St. Louis, Missouri, to which they sent four delegations to request missionaries (or "Black Robes") to minister to the tribe. Their request was finally granted, and a number of missionaries, including Pierre-Jean De Smet, S.J., were eventually sent. The Flatheads are also located in Sula, Montana. The tribe has about 6800 members with approximately 4,000 tribal members living on the Flathead Reservation as of 2013, and 2,800 tribal members living off the reservation. Their predominant religion is Roman Catholicism. 1,100 Native Americans from other tribes and more than 10,000 non-Native Americans also live on the reservation. As the first to organize a tribal government under the 1934 Indian Reorganization Act, the tribes are governed by a tribal council. The Tribal Council has ten members, and the council elects from within a Chairman, Vice Chairman, Secretary and Treasurer. The tribal government offers a number of services to tribal members and is the chief employer on the reservation. The tribes operate a tribal college, the Salish Kootenai College, and a heritage museum called "The People's Center" in Pablo, seat of the tribal government. The tribes are the biggest employer on the reservation. In 2011, they provided 65% of all jobs. The tribes own and jointly operate a valuable hydropower dam, called Séliš Ksanka Ql'ispé Dam (formerly known as Kerr Dam). They are the first Indian nation in the United States owning a hydroelectric dam. CSKT also operates the only local electricity provider Mission Valley Power, as well as S&K Electronics (founded 1984), and the internationally operating S&K Technologies (founded 1999). Other tribal businesses are the KwaTaqNuk Resort & Casino in Polson (county seat of Lake County and most populous community on the reservation) and Gray Wolf Peak Casino in Evaro, Montana. ^ a b c d e f g h i j k l m Teit, James A. (1930): The Salishan Tribes of the Western Plateaus. Smithsonian Institution. 45th Annual Report of the Bureau of American Ethnology. Washington. ^ "As Told by Charlie Russell (1912) - Discovering Lewis & Clark ®". www.lewis-clark.org. Confederated Salish and Kootenai Tribes of the Flathead Reservation. 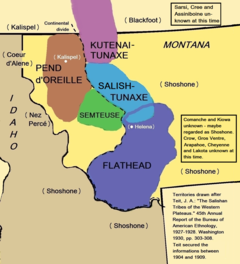 A Brief History of the Flathead Tribes. St. Ignatius, Mont: Flathead Culture Committee, Confederated Salish & Kootenai Tribes, 1979. Johnson, Olga Weydemeyer. Flathead and Kootenay; The Rivers, the Tribes, and the Region's Traders. Northwest historical series, 9. Glendale, Calif: A. H. Clark Co, 1969. Salish Kootenai College. Challenge to survive : history of the Salish tribes of the Flathead Indian Reservation (2008). Volume 1, From Time Immemorial, Traditional Life. Volume 2, Three Eagles and Grizzly Bear Looking Up Period, 1800-1840. Volume 3, Victor and Alexander Period, 1840-1870. Ronan, Peter (1890). Historical sketch of the Flathead Indian Nation from the year 1813-1890: embracing the history of the establishment of St. Mary's Indian Mission in the Bitter Root Valley, Mont. : with sketches of the missionary life of Father Ravalli and other early missionaries: wars of the Blackfeet and Flatheads and sketches of history, trapping and trading in the early days. Helena, MT: Journal Publishing Co. Retrieved 2014-03-01. Smead, William Henry (1905). Land of the Flatheads; a sketch of the Flathead Reservation, Montana, its past and present. Missoula, MT: Press of the Daily Missoulian. Retrieved 2014-03-01. Broderick, Therese (1909). The brand, a tale of the Flathead reservation. Seattle: Alice Harriman Company. Retrieved 2014-03-01. Wikimedia Commons has media related to Confederated Salish and Kootenai Tribes. Wikimedia Commons has media related to Kootenai (tribe). Herbermann, Charles, ed. (1913). "Lake Indians" . Catholic Encyclopedia. New York: Robert Appleton Company.